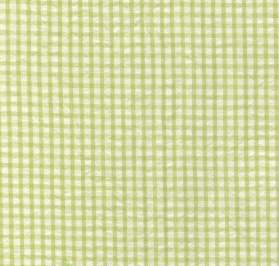 Seersucker Check Fabric: Lime Green. 60″ fabric with. 100% cotton seersucker. Pair it with the Lime Green Seersucker Stripe fabric we’ve placed down below. *All our fabrics are sold in whole bolts only. Average bolt sizes run 14 to 18 yards each. There is a 1 bolt minimum requirement for all orders. The cart will charge for a 16 yard bolt. Note that your invoice will be adjusted accordingly for bolts that run under or over 16 yards.